Most of the time I make South Indian style Rava kesari ( Rava = semolina in English) for functions, pooja and celebrations at home as it is our family favorite and the most comfortable sweet for me .I have already shared varieties of rava kesari recipes like rava kesari with milk/ Paal kesari, microwave rava kesari, semiya kesari, pineapple kesari, mango kesari etc. 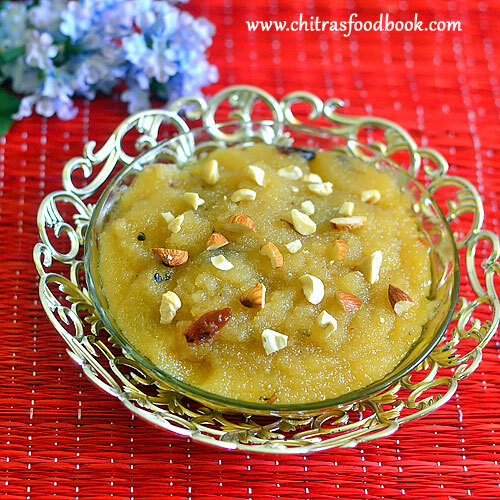 Its been my long time wish to try North Indian style Sooji ka halwa/ Rava sheera. So I tried it for New year 2017 celebration yesterday.In North India, Suji ka halwa is one of the most popular and easy halwa recipes that is made in all houses for all the festivals & occasions and is served in most of the temples as Prasad. This halwa is served along with Poori and Chole for breakfast.Halwa poori chole is one of the most popular breakfast combo in North India and Pakistan. 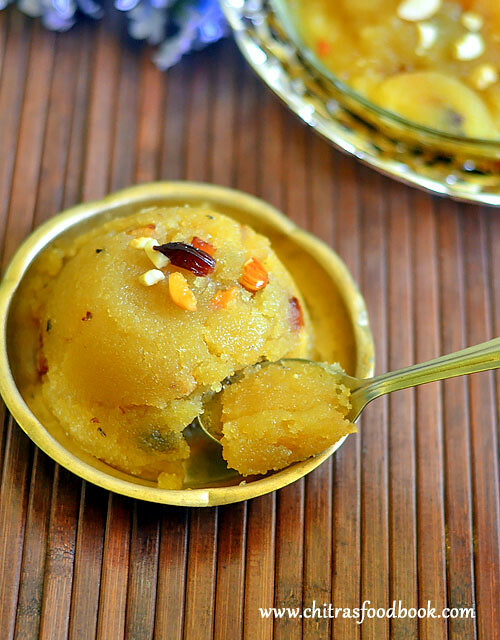 In Karnataka, people call this sooji halwa as Kesari bath. 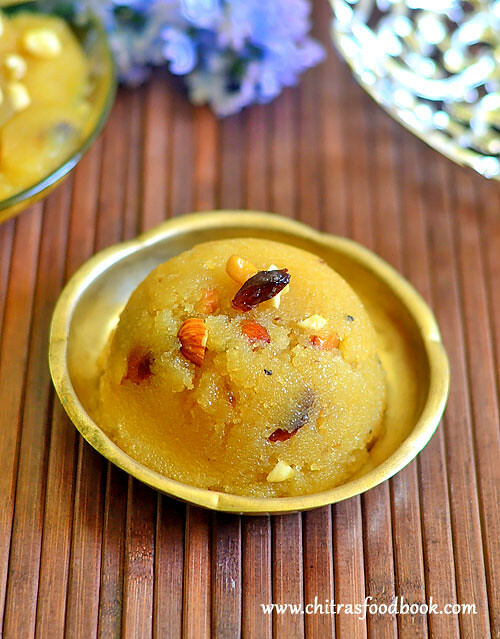 Rava/sooji, Sugar and ghee forms the basic ingredients for this sweet recipe. But Rava kesari, suji ka halwa and kesari bath has its own variations in the quantity of ingredients, method of preparation, taste, color and texture.I watched few You tube videos and followed Food viva for the recipe. Though it tastes mildly sweeter than the South Indian rava kesari, it was dripping with ghee and finger licking good. We loved it very much. Its taste reminded me of the banana sheera I had in my friend’s house Satya Narayana pooja. Its very easy to prepare for special occasions and to treat your surprise guests. For variations, you can use milk instead of water. Lets see how to make North Indian special suji ka halwa/ Sooji halwa/Rava sheera recipe with step by step photos and a detailed video !! Soak saffron threads in 1 tbsp hot milk.I din’t use saffron in this recipe. I used cardamom powder alone. Heat 1/3 cup of ghee in a kadai.Roast the dry grapes, cashews and almonds till dry grapes bloat and nuts turns golden. Add rava and roast well for 4-5 minutes in medium flame. Rava turns light golden brown in color. Add 1.5 cups of water to the rava and mix well till 3/4 th of the water is absorbed by the rava and becomes semi thick.Keep the flame low and cover the kadai with a lid. Cook the rava for 2-3 minutes. Open the lid and add sugar, cardamom powder and saffron milk ( if using). Mix well without lumps.Sugar melts and the mixture will become watery. Keep the flame medium and mix well. Halwa turns thick and starts to leave the sides of pan. Immediately add 1tbsp of ghee, mix well quickly and transfer the halwa to a bowl. Do not wait for the halwa to thicken completely. Remove it as soon as it becomes semi thick because this suji ka halwa becomes dry and hard when it cools down.So remove it at the right time. Garnish with few nuts and serve warm. Add more sugar ( Say 3/4 cup of sugar) if you need more sweetness. You can use milk instead of water but cook the rava for more time if using milk. Do not reduce the quantity of ghee. It helps to keep the halwa soft. If you don’t want to add more ghee, use half the quantity of oil. 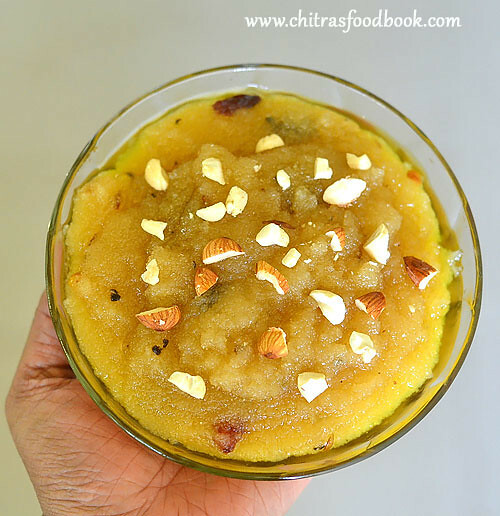 Try this easy, yummy Suji Ka halwa/Rava sheera at home and enjoy ! !